·How To Custom LED Display? Nowadays big and bright, transmitting as a rule a “vivid” advertising video, LED screens (LED — Light Emitting Diodes) are widely used in advertising. Recently they can be seen more and more often on sports arenas where screens are used simultaneously as information displays and as means of broadcasting of the most interesting moments of competitions. Besides they are highly valued in show-business where they sweepingly force out less effective for big stages projective systems. 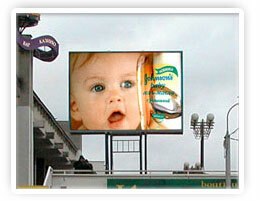 Sales of advertising time on LED screens is a stable source of income for advertising agencies. The possession of your own display is a doubtless plus for the image and business of any company (more often these are big companies, banks, publishing houses, casinos, hotels, entertainment complexes, interested in the promotion of their goods, attracting of new customers to their offices, etc.). nowadays TV shootings or a concert are hardly possible without a screen or display cabinets as a part of graphic composition for the stages. 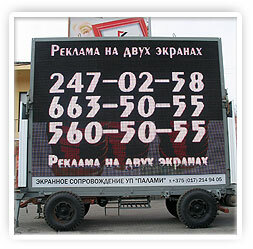 Running sponsors’ commercials on a display brings additional profit for the organizers of an action. Are indispensable during holidays, concerts and mass city actions. Information warning systems at railway stations, airports, manufacturing departments, etc..